On December 17, 2018, an extraordinary session of the Synod of the Ukrainian Orthodox Church was held at Kiev-Pechersk Lavra. The Synod adopted an appeal to the archpastors, pastors, monastics and faithful. Thus, this gathering represents the unification of schismatics and has no relation to the Ukrainian Orthodox Church. For our Church, nothing has essentially changed, since the schismatics have remained in schism, and the Ukrainian Orthodox Church remains the true Church of Christ in Ukraine. No one in the world doubts the validity of the hierarchal consecrations and priestly ordinations of the Ukrainian Orthodox Church and the grace inherent in the Mysteries performed in our Church, which cannot be said of the newly-formed structure. We report with sorrow that for straying into schism, the Holy Synod was forced to relieve His Eminence Metropolitan Simeon of Vinnitsa and Barsk of administering his diocese and suspend him from performing divine services, and also suspend from service His Eminence Metropolitan Alexander of Pereyaslav-Khmelnitsky and Vishnevsk. We call upon you all, dear bishops, fathers, brothers and sisters, to pray for the enlightenment of and the return to the bosom of the Church the aforementioned hierarchs and others who have gone into schism. Our Church, like a loving Mother, awaits their return with hope. It is hurtful that one of the initiators of today’s tribulation for the Ukrainian Orthodox Church is the Constantinople Patriarchate, which argues for its right to intervene in our ecclesiastical affairs on the basis of the fact that our Church was at one time in its jurisdiction. We would like to recall that the Russian Orthodox Church was forced to declare its autocephaly as a result of the betrayal of the Orthodox Faith by the Constantinople Patriarchate with the signing of a pact of unity with Rome at the Ferrara-Florence Council of 1439. This spiritual betrayal of the Orthodox Faith became the main reason for the separation of the Kiev Metropoliate from Constantinople as well. The Unia wrought division in ecclesial relations and mistrust, which deepened when over the course of centuries and even more troubled times for Orthodoxy in our lands, the Church of Constantinople did not provide due pastoral care and aid. The Kievan Metropoliate, which was weakened from the religious strife with the Uniates, debilitated through wars, especially after the Brest Unia of 1596, aiming to preserving the Orthodox Faith entered into the jurisdiction of the Russian Orthodox Church at the end of the 17th century. 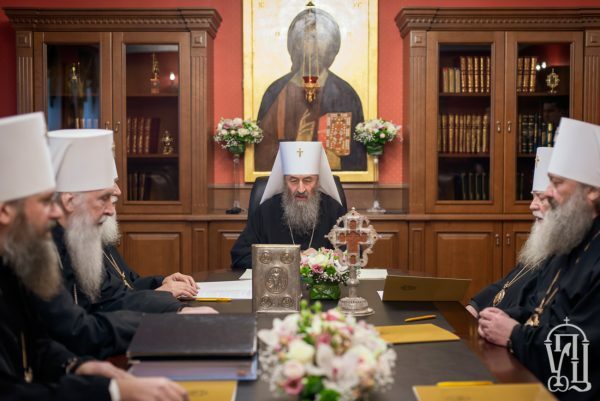 That is why the Constantinople Patriarchate today has no moral or canonical rights to meddle in the internal affairs and spiritual life of the Ukrainian Orthodox Church. Moreover, the actions of the Constantinople Patriarchate have already resulted in the impossibility of restoring unity of Orthodox Christians in Ukraine for the foreseeable future, if ever. Dear bishops, fathers, brothers and sisters: We turn to you with love and appeal to you to continue to preserve the purity of the Holy Orthodox Faith, to keep spiritual unity with our Holy Ukrainian Church, which is the canonical successor to the ancient Kievan Metropoliate, which came into being by the prayers of Apostle Andrew the First-Called and through the labors of Holy Prince Vladimir, Equal-to-the-Apostles, and within which our glorious ancestors lived in service to God. We express our gratitude to the hierarchs, clergy, monastics and all laypersons who during these difficult times endure coercion and confirm their dedication to the Holy Ukrainian Orthodox Church. Holy Scripture teaches us: “Be thou faithful unto death, and I will give thee a crown of life” (Revelation 2:10). We call upon all the faithful flock of our Church to pray for those who, without understanding this, despise us and our Church. May the Lord forgive them. Meanwhile, you love your Church, love our Ukrainian Homeland and do all you can to ensure that there is peace, patience, concord and true Christian love in our land and among our people. Primate of the Ukrainian Orthodox Church.